Volunters needed for all outreach events above to help with the booth as well as set up (1 1/2 hrs before event) and pack up (up to 1hr after the event). B.E.A.C.H. 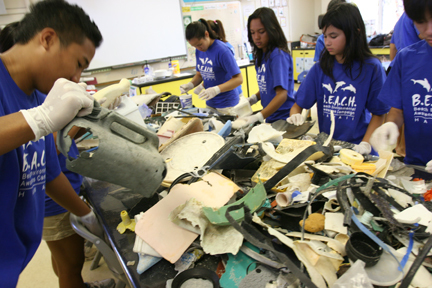 welcomes volunteers 12 years and older to help sort and research marine debris in Kaneohe. Volunteers can help on any day from Monday to Friday and some Saturdays and Sundays between 9am - 12 noon and 2pm - 5pm. No experience needed, training will be provided. Please call 393 2168 for more information. B.E.A.C.H. 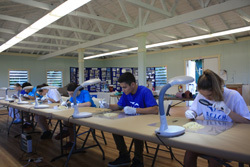 welcomes volunteers 15 years and older to help sort and research microplastic marine debris in Kaneohe. Volunteers can help on any day from Monday to Friday and some Saturdays and Sundays between 9am - 12 noon and 2pm - 5pm. No experience needed, training will be provided.